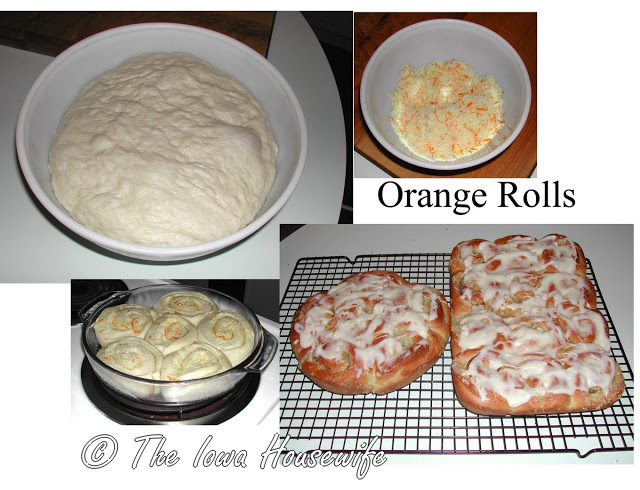 I wanted to try making Orange Sweet Rolls and decided to use the roll dough I use the most for coffee cakes and cinnamon rolls. The filling and glaze is just made up as I went, not difficult as they are made like most cinnamon rolls. Well they were a great hit and the aroma of them baking had everyone in the kitchen waiting till they came out of the oven. The roll dough keeps well in the refrigerator for at least seven days so you can make as many or as few as you want or need at one time. You could add raisins or nuts to the filling if you want, Golden Raisins or Slivered Almonds would be good. Stir the grated orange rind into the sugar and set aside. Sprinkle with the sugar you have added the orange rind to. Roll up starting with the long side. Slice into 1/2 inch slices and place in greased pan. Using two thirds of the dough I had a 9x13 inch pan and a 9 inch round pan full. Let raise for 1 hour or until double in bulk. Bake at 375° for 30 to 35 minutes. If getting too dark lay a piece of foil over them. Tip pan over on rack and then invert back right side up. Scrape any sugar left in pan and put on rolls. Let cool on rack while you make the glaze. If too warm the glaze will melt and run all over. Add orange juice till frosting is the thickness you like. Remember it will thin a little more if put on warm rolls. I tried clicking on the roll dough link and it looks like it is broken. Thanks Pat, it is fixed now. It is a very good roll dough or just use one you have and like. Thanks, they are very good. Make a nice change from cinnamon rolls.